“The chef’s toque is the new tiara,” she said in her introduction to “Looking Forward: How Consumers Find Information and Inspiration for their Wine Purchases.” With the seemingly ceaseless proliferation of food, cooking and wine-inspired TV shows and movies, “Children are now asking to dress as chefs for Halloween,” Cochran said. “Culinary tourism has arrived,” contributing an annual $97.6 billion just to California coffers. Christian Miller, Full Glass Research/Wine Colleagues, acknowledged that when the recession hit, “We got smacked.” But, he explained, this economic downturn is affecting the wine industry differently than in previous iterations. During the shorter, shallower recessions of 1990-91 and 2001, wine sales grew. The 1981-82 recession, he said, was more comparable, but it occurred at a very different stage of wine industry history, when wine was much less an integral part of U.S. culture. “In our culture, luxury purchases respond quickly” to economic trends, he pointed out. “This is not the Great Depression.” What’s different about this downturn, Miller explained, is its severity, with financial wealth taking a dive. There is, too, a “recession psychology,” but different generations are reacting differently. The Boomer and Millennial generations, wine’s key consumer demographic segments, report divergent changes in habits regarding wine consumption, he said. 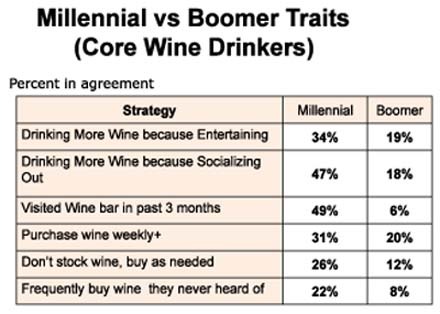 Perhaps predictably the huge and growing Millennial generation of consumers (those born from 1980 onward) is more optimistic, and their wine purchasing patterns reflect this, as they continue to indulge in on-premise consumption to a far larger degree than the elder Boomers, born 1946-1964. Still, Miller pointed out, 29% of core wine consumers of all ages report buying less wine in the $20-$30 price range. What does this all mean? Will there be a comeback for high-end wines? The answer is still equivocal, he said, citing historical example. “Quality and prestige are relative concepts.” Reductions in on-premise consumption reflect reductions in real personal wealth, and, he noted, research indicates that consumers report high levels of satisfaction in the $15-$30/bottle price range. Millennials are more likely to experiment with wines from different regions, and different varietals, Miller said, but are less likely than their elders actually to visit wineries. This poses a challenge to marketers, because, “Winery visitation has an enormous impact” on consumer impressions. There is a huge bump in “excellent” ratings of wines or wineries from consumers who’ve actually been to the tasting rooms. Wineries and winery associations must make a concerted effort to pull Millennials to their regions. Philip James, co-founder and president of Snooth.com, the world’s largest wine website with 1 million-plus users per month, explained how wineries can create and profit from “conversational marketing,” including the new but already familiar social media. Tools such as Facebook, Twitter and Yelp can only be effective for commercial entities if they embrace authenticity and grassroots growth. “Be open and honest,” he stressed. “Let them get to know you, warts and all.” Your linked-in consumers are already doing this for you, he pointed out. “It’s free brand marketing. Nurture your evangelists, and address your troublemakers,” with real responses to every message. To attain authenticity in the online forum, you must first establish permission. Remember, too, “You can’t control the conversation,” James said. “Allow your user to self-select. Respect their channel preferences, and migrate their value up by being open, honest and building trust. Wineries should consider themselves “publishers,” and include bottle shots, tasting notes and food pairings in their online media. “Do not ever take down old content,” he insisted. Even if you’ve sold out of a particular vintage, someone will have it in his shop or cellar, and will want to look it up. And do anything you can to make it easy for your customers to promote you. Leverage each platform by putting it to its best use: Use Facebook to build a fan club, form a group; Yelp for reviews of your winery and releases, and so on. “Don’t reinvent the wheel,” he advised. Wine is a lifestyle keystone, he pointed out. “Wine drinkers are passionate, and wine is highly correlated with travel, food and home websites, and luxury lifestyles.” Wine drinkers are passionate individuals with discretionary income, even if much of the luxury lifestyle is still “aspirational” for them. Make sure that your winery website (and online communication) capitalizes on the “romance” of the wine lifestyle. Snooth and other wine retailers focus on value: satisfying demand. Your winery website can help create demand, if you infuse it with the “romance” of the wine lifestyle. Despite its own economic dilemma, the state recognizes the need to protect and invest in travel. The perfect storm of 2009: Recession, restraints on business travel (the “AIG effect”) and H1N1’s inhibiting influence on leisure travel spurred a need for even more media and official support. The “AIG effect,” spawned by public outrage of that corporation’s much-publicized, post-bailout gathering at a “luxury resort,” prompted some accommodations to rebrand from “resort” to “hotel,” a move that resulted in a 10% boost in reservations, according to Beteta. • Value, value and more value. California’s brand pillars, Beteta explained, are Diversity, Attitude, Lifestyle, Culture and Spirit. Food, wine and indulgence are among its chief “destination drivers,” and the campaign’s dual-edged tag line: California -- Find Yourself Here, capitalizes on these motivators. Beteta said that CTTC’s website, with its high-graphic content and interactive trip planning tools, is designed to provide an inspirational starting point for potential visitors; reservations can be booked on site to close the deal. Regional and winery links are included. Beteta, who also works with the U.S. Travel Association, stated that the U.S. is the only country in the world that does not have a national destination marketing program. It’s hoped that the new U.S. Travel Promotion Act, modeled upon California’s efforts, will help to “grow the pie,” via contributions from the public and private sectors. “It’s an opportunity to create more demand,” for wine country across the continent, Beteta said.